WASHINGTON (Reuters) - The Trump administration warned Republican lawmakers Tuesday about record numbers of illegal crossings at the southern border with Mexico as Congress appeared to be on the verge of terminating President Donald Trump's declaration of an emergency there. Homeland Security Secretary Kirstjen Nielsen visited the U.S. Capitol as the White House sought to discourage more Republican defections on the measure rebuking the president. Republican senators had a "spirited discussion" on the matter, Senate Majority Leader Mitch McConnell said. 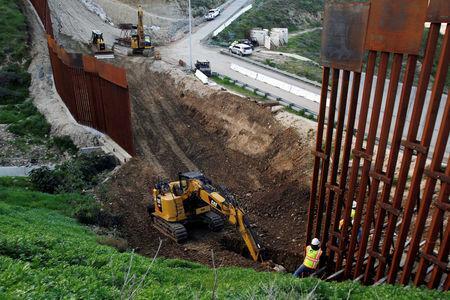 Trump declared an emergency at the border Feb. 15, saying this allows him to use money that Congress has appropriated for other purposes in order to build a border wall. Trump says the wall is needed to stop illegal immigration and drug trafficking. But there does not appear to be a super-majority in Congress to override an expected Trump veto. Emerging from a lunchtime meeting with Nielsen, some lawmakers said she made a strong presentation about a crisis at the border, with record numbers of immigrants showing up. "Secretary Nielsen just released the latest apprehension numbers," with 60,000 apprehended at the border in January and 76,000 in February, Montana Republican Steve Daines said. "Based on the current trend lines this will be an all-time record year for illegal apprehensions" at the southern border, he said. Daines supported Trump's emergency declaration, saying, "I am a northern border-state senator with a southern border crisis. It is drugs, it is meth, it is destroying our communities and families in Montana." But Nielsen's presentation did not convince Senator Rand Paul, who announced at the weekend that he would join three other Republican senators to vote to block Trump's border emergency. This is enough for it to pass, assuming all Senate Democrats back it as well. "To me it has nothing to do with immigration. It has to do with whether or not the president can spend money that Congress didn’t give to him," Paul told reporters after the lunch. Paul said he thought there are at least another six Republican senators who feel the same way he does but "I don't know if they will all follow through with it" and vote to nullify the president's declaration. Paul also said he had spoken to Trump about the matter. "I talked to the president the other night about it. I think he understands that I have strong beliefs that the Constitution indicates only the Congress should spend money." 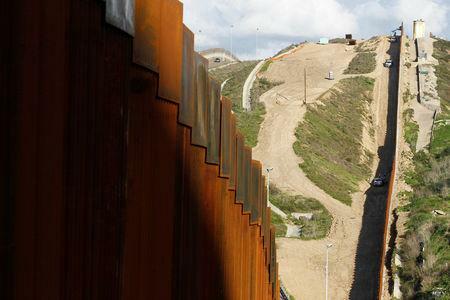 Last month, Congress rejected Trump's demand for $5.7 billion to help build a border wall, prompting him to take unilateral action. Democrats insist there are better, less expensive ways to improve border security than building border walls. If the Senate joins the House in voting to overturn Trump's emergency declaration, the president's anticipated veto would be the first of his presidency. During his first two years as president, Republicans controlled the Senate, House and White House. That is in contrast to Trump's three immediate predecessors who all vetoed bills during the periods in which their party controlled the Congress and White House - and is a reflection of how closely Republican lawmakers and Trump have worked in tandem while in power.